We can plan all we want, but sometimes the Holy Spirit just takes over. Sunday, July 10, was scheduled to be the continuation of a sermon series delivered by Niki Christiansen at West Court Street Church of God in Flint, Michigan. But how could the church ignore the tragic events which had since unfolded in Louisiana, Minnesota, and Texas? Niki and her husband Paul serve as co-interim pastors for the church, and they knew something had to be done. After all, the sermon she was scheduled to preach was about unity—a topic we love to talk about, but don’t always put into practice. Since November 2014, a multiethnic church has met for worship in the West Court Street building at the same time, in another room. The stage was set perfectly for what would happen next. Not only did the church have a regular worship service planned, but they also didn’t have the luxury of planning a special service weeks in advance. One thing Niki and Paul knew for sure was that they had to at least acknowledge the headlines, praying fervently for God to reveal himself as the answer for such difficult times. Instead of assuming how they could best pray for their African American brothers and sisters, they asked. “It’s not an easy subject to broach,” Demetrius Hunter, deacon at Damascus Road Church. “I appreciated that they reached out to us to get a grasp of the situation.” At the risk of Damascus Road saying no, Niki took a step farther and asked if his church would join their service for the last fifteen-or-so minutes so they could all pray together. Demetrious Road responded that it was a great idea, but they had a better one. They’d cancel their service and join West Court Street for the entire morning. 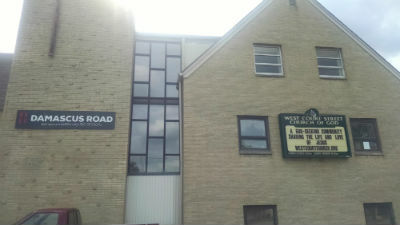 Photo: West Court Street’s building features a sign for Damascus Road. Instead of the usual components of a Sunday morning worship service at West Court Street, most of the time was devoted to dedicated prayer and reading of the scriptures. “It wasn’t a time for commentary,” Paul recounts. “It wasn’t a time for political discourse. But it was a time for crying out to God. We had multiple people come up from both churches to pray.” Then after about an hour, the two congregations closed the service in song together. Join us in Philadelphia, Pennsylvania, for the Church of God Regional Convention and CHOG Table, September 27–29, at which we will wrestle with the important issues of race and reconciliation. Register online at www.chogconvention.org. Were you blessed by reading this story? Support the ongoing work of Church of God Ministries with your gift to the World Ministry Fund at http://www.jesusisthesubject.org/world-ministry-fund/. This entry was posted in All Church of God, Great Lakes and tagged Damascus Road Church, Demtrius Hunter, Flint, Michigan, multicultural, Niki Christiansen, Paul Christiansen, race, racism, Reconciliation, unity, West Court Street Church of God. Bookmark the permalink.